A couple of kids paddle their canoe through a marshy channel, under the shade of some dogwoods. It’s all natural. Except for the defunct industrial crane towering in the background and the stone outcropping, just to the right, filled with patio umbrellas and chatting grownups. 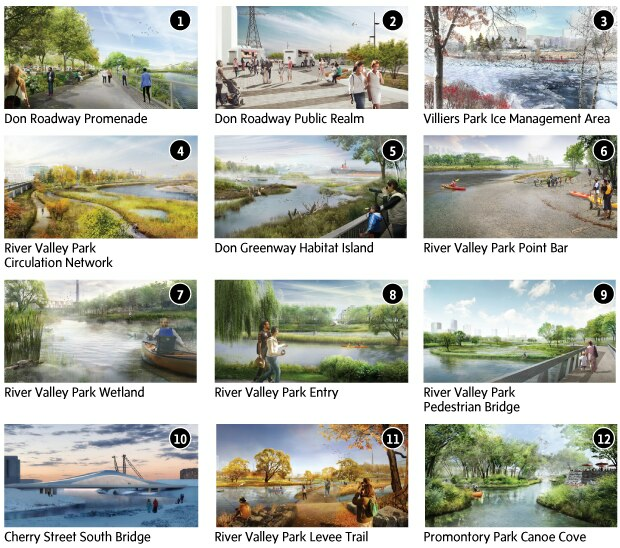 This scene is a drawing of the near future on Toronto’s waterfront – part of the 80 hectares of parks in the billion-dollar Port Lands Flood Protection project now planned for completion by 2023. As those new parks take shape, they present a novel idea about landscape: They scramble the natural and the artificial, and teach us that there’s really no line between the two. Map of existing and future flood protection areas, including the Port Lands and adjacent areas that are currently not flood protected. The effort by the public agency Waterfront Toronto, which broke ground last year, will reshape the mouth of the Don River, adding a second opening into Lake Ontario plus a spillway for flood events. The point is to make the river flood less dramatically during extreme weather events. And as flooding in early August reminded Torontonians, “extreme weather” will be increasingly common as we feel the effects of climate change. The designers are working to create parks that serve an ecological function, as infrastructure, and serve as a neighbourhood hub. “This is where we, as urban people, get to connect with nature,” says MVVA’s Herb Sweeney. The specific character of those parks is now taking shape. When I met MVVA’s Emily Mueller de Celis, Mr. Urbanski, and Mr. Sweeney recently in Toronto, we were standing above a room-sized model of the park being assembled for a public meeting. I could see it from a giant’s-eye view. 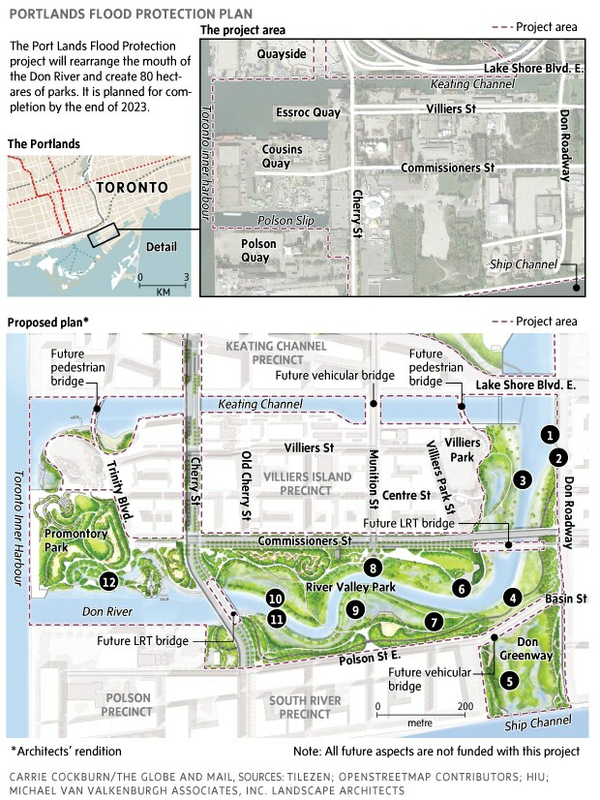 Starting at the northeast corner of the site, the river rolls under a rebuilt Gardiner Expressway, with a new road lined by a wide promenade and an allée of trees. Then it swoops west, lined by a new River Valley Park. Paths curve their way through low marshlands and higher deciduous woodland. As the river curves back and forth, a point bar – a sandy point – provides a jumping-off point for kayakers and waders. Carefully positioned pedestrian bridges frame views of the landscape and connect with boardwalks. And a few sizable hills provide lookout points, the only ones in what was originally flat marshland. A smart visitor might ask how those got here. Not by nature. Each specific zone here, defined by water level, topography and soils, will be home to a different set of wildlife and plant species. When they are realized, they will behave just like a variety of non-human-engineered habitats. This approach creates dynamic and vibrant places. MVVA’s done it before at the nearby Corktown Common and at Brooklyn Bridge Park in New York, mixing obviously human interventions with landforms and plant matter. “It’s a very contemporary sort of juxtaposition,” Mr. Urbanski says. This approach challenges a central dialectic in landscape architecture. At one end, there are attempts to imitate nature: Frederick Law Olmsted’s Central Park is the singular example, with its faux-natural hills, copses and lawns. Then there are landscapes with strong geometric patterns: the sculpted and manicured greenery of French gardens, and the squared-off landscapes of 20th-century Modernism. MVVA’s parks erode this boundary line. The Port Lands parks will be filled with native plants that do their own thing. But the position of those stands of trees? The angle of that bridge? That conveniently placed cove? None of that is accidental. It’s art, geared to create a vivid experience between people and their environment. Even the river itself will be ersatz. It will curve back and forth, mimicking the way that waterways in this region do naturally, says Ms. Mueller de Celis. “It will have a very specific regional character,” she explains, “but it won’t actually move.” Natural rivers meander, or shift their course. These riverbanks will stay still, thanks to soil engineering and hydrology and lots of earthworks. And for a thoughtful visitor this place will provide a giant, 80-hectare lesson about how people reshape the earth, and a good place to contemplate how we can do a better job.